We all know about the tiny tastiness that are M&M's. Who can resist? But did you know that you can now print pictures on M&M's too?? 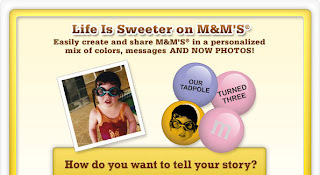 The My M&M's website: http://www.mymms.com/, has tons of creative ideas on how you use photo M&M's and also has a few restrictions: according to the website, they won't accept vulgar language or pictures...they "don't want to leave a bad taste in anyone's mouth."